Acorns symbolise our capacity for growth and abundance. Shiny and green with perfectly fitting cups these small seeds hold the key to huge trees. Plant your creative seeds and watch them grown to greatness reaching up to the sky. Acorns represent how much can come from small ideas coupled with time, patience and effort: the sky is the limit. Citrine is the happiest semi-precious stone of all. A joy stone that attracts money, prosperity and abundance in all its forms. The yellow light of citrine reflects the light of the sun, giver of all life. Like having a piece of sunshine around you citrine banishes sadness and gloom. 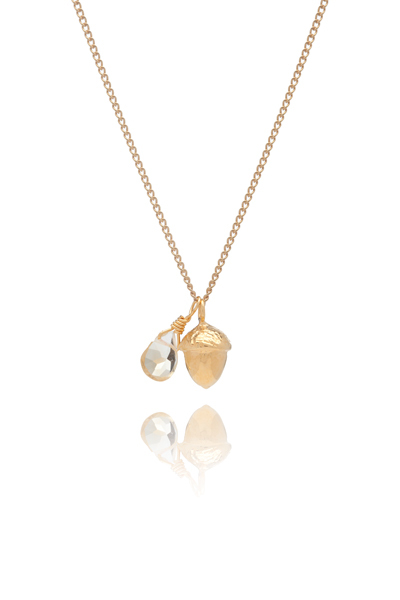 Acorns symbolise prosperity, strength and the ability to grow incredible things from small seeds. Citrine is sunshine in a stone symbolising joy and abundance and attracting money. Use this talisman to open you up to a life of plenty and joy. Celebrate your business success or focus your intention on the success you can achieve. The MONEY necklace is about prosperity, abundance and joy.